Rockwood Manor Wedding Photos showcase the grand, historic Rockwood Manor. The manor is nestled in the mountains of Dublin, Virginia and is easily accessed from downtown Washington, Bethesda, and Northern Virginia. Rockwood Manor Wedding Photos show the magnificent estate’s vineyard, gardens, and beautifully designed manor house. The property provides for a variety of settings for a unique and magical wedding day. 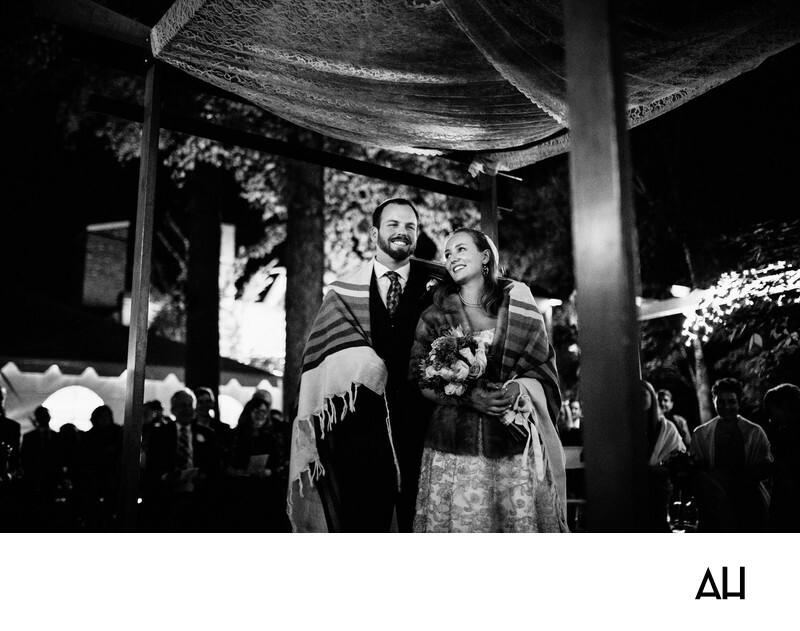 This black and white photograph shows the bride and groom during their outdoor Jewish wedding ceremony. The ceremony was held on the grounds of the estate, with the structure of the grand manor serving as a dramatic backdrop for the nuptials. Strings of tiny lights and lanterns give the scene of the ceremony an enchanting glow as the couple join together in marriage. The pair stand beneath a lace canopy, the chuppah, which symbolizes the home the couple will build together. Around the shoulders on the bride and groom is a tallit. The tallit is often meant to symbolize the union of the couple as they become one and are enveloped by the “wings of God”. The groom in the photograph looks forward, grinning from ear to ear. His bride gazes up at him, love pouring from her smile and shining out of her eyes. This is a fall wedding but the days have grown darker and it is almost winter, so the bride wears a fur coat over her intricately embroidered dress. The chilly autumn air blows over the soon-to-be newlyweds, but the joy at that radiates from both the bride and groom in this moment keeps them warm.